This is the last part of a five-part series presenting the conclusions I drew from my 50,000 word original research study of The Moon’s Nodes in Action. To read the first four posts, scroll down to the end of this one. I started out with certain questions. Do the Nodes say something specific, or do they act as a reinforcer for information which can be derived from other chart factors ? I think I have demonstrated quite clearly that the Nodes and their attendant planetary/Angular links can be used on their own to sketch out a clear picture of the basic structure of a person’s life path and the archetypal energies which need to be responded to and brought into the journey, for that person to be all they can be. It seems that strong outer planet links, especially Pluto’s conjunctions or squares to the natal Nodal axis, and strong prevailing major patterns eg Uranus conjunct Pluto opposite Saturn conjunct Chiron linked to the Nodes, bring some people a more challenging life than others. 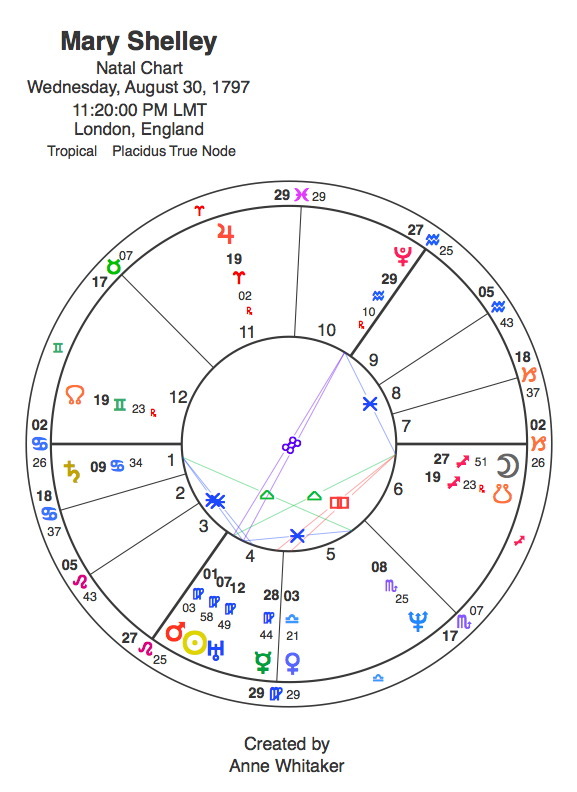 Mary Shelley’s chart is a very good example of this, with Uranus, dispositor of Pluto conjunct MC, conjunct her Sun and square her Nodal axis. I have distinguished between minor and major Nodal activity in transits and progressions, and demonstrated that the major effect is what appears to be present when turning points occur. This would suggest that in contemplating the unfolding picture of a person’s life, the combination of Nodal activity with the foreground presence of outer planets, especially Pluto, points out that something really special is going on and should be carefully noted. I also asked whether astrologers are missing something important by not paying attention to the Nodes, natally and as life unfolds. I think the answer to this is yes, with particular reference to the transitting Nodal cycle and the eclipse seasons which accompany them. The pair of houses highlighted by the transitting Nodal axis and eclipses should be carefully observed, especially if the pre-natal eclipse degrees crop up in the form of a returning eclipse, or a current eclipse is triggering natal patterns linked in to either of the pre-natal eclipses. I appreciate that we all need to earn our living and there are a multiplicity of interpretive factors available which would take all day to prepare if they were to be included in every reading. We have to be selective. 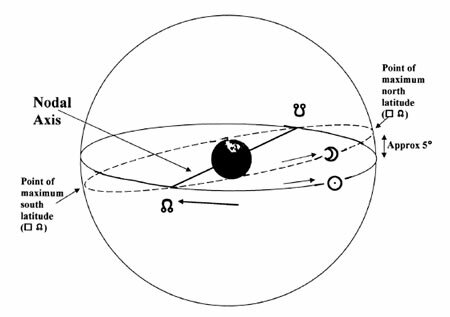 But having done the research for this thesis, I think that, in preparing a reading, if the clustering effect I have been discussing is in evidence, it is important to pay particular attention to that person’s natal Nodal pattern and the current Nodal/eclipse picture. The client is then likely to be bringing matters of a life-changing nature to us for discussion, which offers us roles both as observers and midwives; human agents in the here-and-now of those mysterious ‘watchers by the threshold’ whose numinous presence in our lives is symbolically represented by the Moon’s Nodes in Action. Thanks to the many readers of this series for your interesting emails in response to those conclusions regarding the significance of the Nodes. Any other responses continue to be welcome. I have archived the series (see Categories on Home Page) for easy future reference. I will also at some point be publishing, over several installments – may even give it its own blog – my long case study on Mary Shelley’s authorship of “Frankenstein”, bringing in charts of all the significant figures influencing her writing of what has become a modern myth at the very young age of 19 – and her first Nodal Return. This entry was posted in Astrology Article Archive 1 – "Not the Astrology Column", Astrology Article Archive 3 – The Moon's Nodes in Action and tagged "as above so below", 'Frankenstein', Anne Whitaker, Anne Whitaker Writing from the Twelfth House, Mary Shelley, Moon's Nodal axis, Moon's Nodes, pre-natal eclipse degrees, watchers by the threshold, Writing from the Twelfth House. Bookmark the permalink. Thank you! While reading this part of your series I sit here with tears in my eyes. You have helped me “SEE” a little more understanding of TRANS PLUTO on my NATAL MEAN/TRUE SOUTH NODE…6/8 Capricorn. Now the TRANS NORTH NODE 29 SAG is trine my N.MERC 29 LEO 50r. For now this is all I want to say along with, again, a HUGE THANK YOU FOR YOUR SHARED INFORMATION !!! you are more than welcome, and I am glad that the results of my research have been helpful to you, as well as quite a few other people who have been in touch. Glad I dusted off that thesis! And look out for the Mary Shelley case study – keep dropping by.